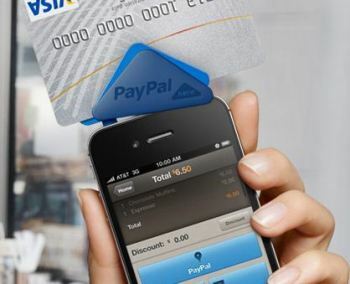 The PayPal Here mobile payment service launched last week to a select group of retailers, and it will be available later in 2012 to all businesses. How does it appear to stack up against Square, Intuit GoPayment, and other mobile payment systems that use a card-reading device? PayPal Here lets you accept all major credit cards, debit cards, cash, checks, as well as PayPal payments. It also allows you to invoice from the app--arguably its greatest selling point. Nearly all other mobile payment systems only accept credit cards and don't allow for debit processing. PayPal is slightly undercutting Square with a 2.7 percent charge per swipe, where Square takes 2.75 percent. Checks can be processed free, and mobile invoicing is available at no charge as well. By contrast, Intuit GoPayment is also only 2.7 percent per swipe, and a high-volume option is available for $12.95 per month, giving the much better rate of 1.7 percent per swipe. You must be doing over $1000 worth of credit card business before you can move to the high-volume service. Cheaper credit card processing rates are available for established businesses through banks and other merchant account companies, but that isn't the market PayPal Here is going for. It's after someone with a kiosk at a farmer's market, not a small regional chain of clothing stores. This also explains why PayPal hasn't gone with the NFC approach, which can be expensive for a micro-business to adopt. PayPal says, "unlike other card readers, the PayPal Here card reader is encrypted". However, both of its main contenders, Square and Intuit, now use encryption with their mobile devices, although Square did just announce a new encrypted card reader. Intuit GoPayment is also guilty of this marketing tactic, stating, "We provide end-to-end encryption unlike many other mobile credit card processing solutions". The Biggest Problem With PayPal Here: PayPal? All transactions that go through PayPal Here are done using your PayPal merchant account. PayPal has admitted during disputes with sites like Regretsy that it will freeze an account that sees a volume spike in transactions as a security precaution. If you'll be using PayPal Here at events, such as trade shows where a volume spike is almost a guarantee, Square's promise of depositing your funds in the bank the next day looks better, as do Intuit GoPayment's lower high-volume transaction processing fees. If you're just planning on the odd sale at a craft fair, this isn't so much of a concern. PayPal Here targets small businesses that want to accept debit cards, or those that aren't concerned about high volume creating a potential problem with their PayPal account. But it won’t be out until later this year, so if you are looking for a payment processing tool for this spring and summer, Square and Intuit GoPayment are your best bets. Angela West lives in an area where they think NFC stands for "New Field Crop". She's written for big insurance companies, small wildlife control businesses, gourmet food chains, and more. Follow her on Twitter at @angelawest and Facebook.